Kmart will close its only remaining store in metropolitan Chattanooga and Sears will shutter its last mall store in the Chattanooga region in September as the retailing giant continues to trim its brick-and-mortar footprint to cut costs and help its survival. Sears Holding Co. spokesman Howard Riefs said Wednesday that the Fort Oglethorpe Kmart store on Battlefield Parkway and the Sears department store in the Walnut Square Mall in Dalton, Ga., are among 72 more stores being closed this fall. Those store closings are in addition to more than 180 already announced this year and will trim the number of Sears and Kmart stores across the country to about 1,200, down from 2,073 five years ago. Riefs called the the closings "difficult but necessary." In its annual report released in late March, Sears said after years of huge losses and store closings "substantial doubt exists related to the company's ability to continue as a going concern." Sears — once the biggest retailer in America — will continue to operate stores at Hamilton Place and Northgate malls in Chattanooga, and Kmart — once the biggest discount retailer in the country — will retain its two stores in Dalton. Sears shut down its store in the Bradley Square Mall in Cleveland and other outlets in Athens, Sweetwater and Maryville in East Tennessee last year. 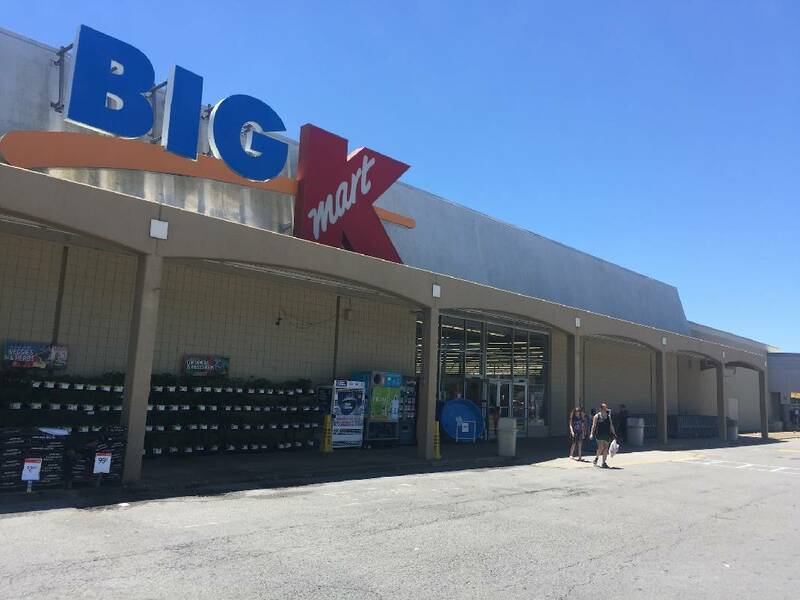 Kmart, which once operated nearly a dozen stores in the Chattanooga area, closed its Hixson store last year after previously shutting down area stores on Highway 58, East Brainerd and Signal Mountain Road in Chattanooga and other stores in Cleveland and Athens. Riefs said a liquidation sale will begin at the Fort Oglethorpe store on June 15 and at the Dalton Sears store the next day. Sears declined to disclose how many workers will be displaced by the store closings, but Riefs said those losing jobs will be offered severance pay and opportunities to apply for other jobs. Riefs also said Sears hopes to keep some of its customer base through its growing online sales. "We have been strategically and aggressively evaluating our store space and productivity, and have accelerated the closing of unprofitable stores as previously announced," he said. "We often hear from our members who are disappointed when we close a store, but our Shop Your Way membership platform, websites and mobile apps allow us to maintain these valued relationships long after a store closes its doors. As a result, we hope to retain a portion of the sales previously associated with these stores by maintaining our relationships with the members who shopped this location." Fort Oglethorpe Mayor Earl Gray said he hopes the local Kmart might still stay open, or another retailer can be found to fill the void if it does shut down. "I guess we'll just have to wait and see, but this store was on the list of those slated for closing before and it survived that cut," Gray said. "I'm hoping it will happen again because this store has been one of Kmart's most profitable in the Southeast and with the other Kmarts closed it has drawn even more people." In Dalton, two Kmart stores will remain open but the Sears store that has helped anchor the Walnut Square Mall since its opening in 1980 will close. The closing comes two years after the anchor at the other end of Walnut Square Mall, JC Penney, also closed its department store. The Hull Property Group, which acquired the 457,785-square-foot Walnut Square Mall in December from the Chattanooga-based CBL & Associates Properties Inc., is trying to revive Dalton's mall with the aid of the city under a Tax Allocation District agreement. "Sears is closing numerous stores across the country at a rapid rate due to declining sales and this failure is not endemic to Dalton or to the Walnut Square Mall but reflects the new realities of retail," said Coles Hull Doyle, marketing director for the Hull Property Group in Augusta, Ga. "We recognize these new realities of retail and have been working closely with Dalton community leadership and other stakeholders to immediately build consensus and an action plan for the future." Doyle said the Sears closing "can cast a negative pall on the entire eastern end of the Walnut Avenue retail corridor," if the retail void is not replaced. "The facility formerly occupied by Sears must be repurposed or demolished in a manner conducive to a first class retail corridor," she said. The Dalton City Council designated the area around the Walnut Square Mall a tax allocation district (TAD) two years ago to allow the developers to recapture additional taxes that may be generated from new investments in the area. Among the 72 additional stores being shuttered by Sears and Kmart this fall, only one is in a retail center owned by CBL, one of the nation's biggest shopping mall developers. CBL spokeswoman Stacey Keating said a Sears department store will close at the Dakota Square in Minot, N.D., in September. "In anticipation of this closure we have proactively engaged in discussions with a number of retailers and other users," she said. "We have a plan in place to redevelop the Sears building and our next steps will be to move forward with negotiations and finalize redevelopment plans."